This has been treated here in different threads already (more problems than success usually). 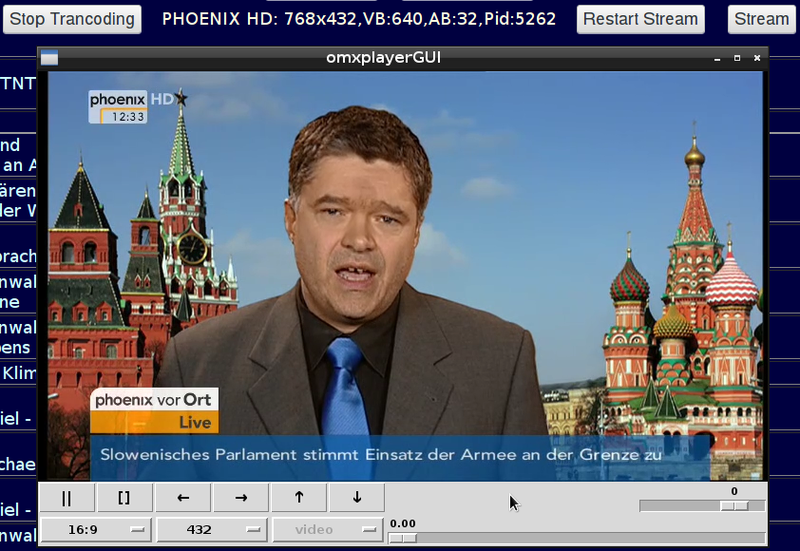 I've successfully implemented real time transcoding of TV (mpeg TS over http) streams in my SAT-TV-Server application (German version only right now). I'm using (a slightly modified version of) Sebastian Droege's http-launch with matching gstreamer1-0 toolchains. Meanwhile I can transcode all types of TV streams. Here's a snapshot of a 720p50 video stream, transcoded to 768x432p50 with a video bitrate of 640 KBit (and audio also transcoded to 32 KBit). I have been asked by a number of people if I could make the transcoding software available as a separate software package, usable with all kinds of TV server backends. The result is my transcoding software rtranscode, which has reached version 4.0 by now. Last edited by gkreidl on Wed Apr 04, 2018 9:19 am, edited 4 times in total. Edit April, 8th, 2018: I've uploaded a new package (same name) containing a bug fix. If you have installed rtranscode V 4 before, just download and install it again. This will install a few binaries and scripts in/usr/local/bin and create the folder /usr/local/share/rtranscode containing a configuration file and and a default (empty) channel database. An existing channel database (from rtranscode 3) will not be overwritten and you can continue to use it, although the database format has slightly changed. The rtranscode4 directory contains the new and extended (75 pages) manual as PDF file, which is also available online. It contains a comprehensive overview, a very detailed program reference and a few tutorials. Read it, please, before starting to ask questions here. A standalone web server, written in Python, which contains its own rtranscode module. It supports user management for different kinds of users. You have to create a channel database, befor you can use it. a script which creates a local GUI for rtranscode, running in kweb. A number of scripts which create all the configuration files, a kweb GUI, a rtranscode channel database and a user script for rtranscode for both backends. Automatic tuning is supported by both rtranscode and the rtranscode web interface. The web interface also supports manual tuning and gives access to the original streams. You will find a detailed description in the tutorials part of the manual. You can use this instead of the 1.10.4 version supplied by the Foundation. The sources of rtranscode, rtc4.so, http-launch and my changes to the gst-omx 1.10.5 module can be found in the "sources" directory. Scaling of 720p progressive streams. 1080i streams require no deinterlacing, if the output size is below 540p. And the scaling quality is better than software scaling, which has to be used on Stretch. rtranscode depends on a large umber of software packages (especially from the gstreamer family) for which I'm not responsible in any way. These packages may (and do) contain bugs, have memory leaks or might simply not work correctly in some circumstances. That's outside of my control. I have no chance to test rtranscode with all possible kinds of server backends (hardware and/or software) and cannot guarantee that it will work in every combination. Last edited by gkreidl on Thu Oct 25, 2018 2:18 pm, edited 16 times in total. Originally this post contained the whole README file of the transcoder package, but in version 4 there is no README file any more, as it contains a full 75 pages manual in PDF format. 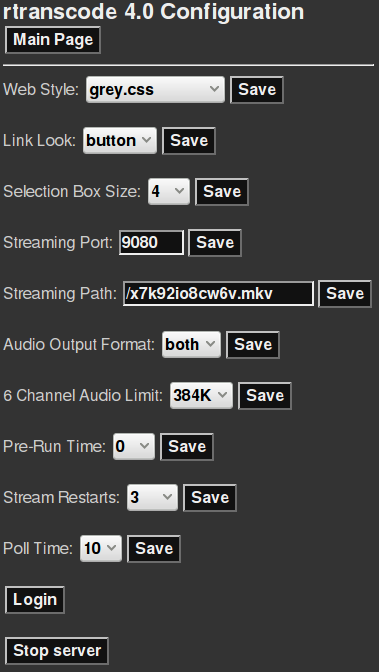 from a channels file and offer a simple selection menu. -path=path output path for stream URL, must start with a "/" and end with ".mkv", default = "/xyz.mkv"
-port=port output port for stream URL, must be greater than 1024, default = "9080"
-q run both rtranscode and http-launch in silent mode, prevents menu mode from working! 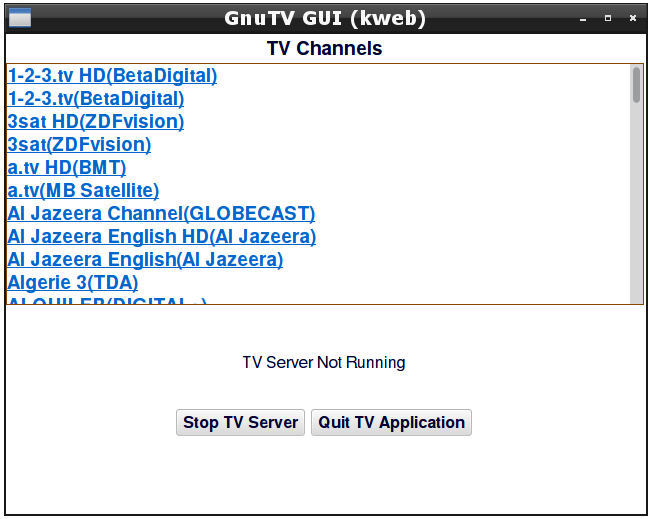 The rtranscode V. 4 package contains a number of tools to create your own TV server backend, using either GnuTV or MuMuDVB. For both backends, tuning and access to the original streams is also supported by the rtranscode web server. For more details, check the PDF manual, which is also available online. Last edited by gkreidl on Thu Apr 05, 2018 9:58 am, edited 6 times in total. Do you think is possible to add flvmux and rtmp output to http-launch? rtmp: no, not without rewriting it completely. A gstreamer tool chain which replaces matroskamux by flvmux might work, but the problem is the audio transcoding: flvmux does not support aac and there is no mpeg audio encoder in gstreamer1.0. 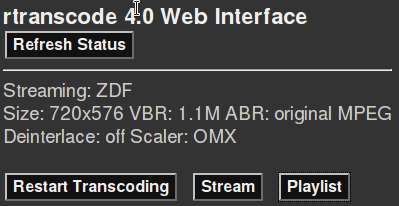 tvheadend uses it's own streaming protocol. You must make sure that it streams pure TS streams. Just a short Information : After some mailing with gkreidl i found the trick. I'd be interested in knowing if anyone has transcoding or viewing of full HD from the antenna of North American digital TV working. Specifically I'm talking about the HDHomerun. I've heard some folks make some claims about doing this off cable but the antenna is supposed to be more demanding. "** (http-launch:3193): WARNING **: Cannot autolaunch D-Bus without X11 $DISPLAY"
Is there any other option for launching transcoding.py in raspbian wheezy ? I've done transcoding on Wheezy, but H264 sources did not work because of a bug in gstreamer1.2 which has been fixed in Jessie (version 1.4 now). I could transcode MPEG streams (you need the mpeg codecs). The bug in the gstreamer-omx Module of Jessie (memory leak) has been fixed recently. Seems to be some nice stuff, but how would one do it if the purpose is to be to actually get the stream back to a PVR client remotely, which is also able to change channels, see EPG etc just as if it connected directly to TvHeadend? What I'm trying to do is using a RPI2 as a TV-server (USB DVB-C) (jessie without any GUI) and use a OpenElec/Kodi remote to get access to the channels I got at home. Whilst SD channels work fine, HD don't, they stutter. I tried compiling TvHeadend with transcoding and adding the MPEG2 license, but the RPI2 doesn't seem to have the power to user the transcoding (no matter which version I choose), since all I get is stutter on both HD and SD. but on interlaced channels i get really ugly pictures that look like bad downscaled interlace. bc that final interlace video isnt "real interlace" (like odd lines are double the size) im not able to deinterlace it at the reciving device. i saw that deinterlacing is possible with gstramer, but im not able to get it working (tried to place the "! deinterlace" pipe at every known position in the config file). do you know how to modify the settings to get the deinterlace working on the PI? Deinterlacing is really a problem I have not solved yet. If the image size is larger than half of the original size it's getting ugly. Software deinterlacing with gstreamer didn't work either (and I'm not sure if that wouldn't be too slow). Unfortunately the omx module doesn't support any interlace function on the GPU. thats very sad, because the rest is working very well. so my resolution will be to set the size of interlaced material at 288p, than it looks proper. and if the stream is progessiv than i gonna set higher resolution. and thank you again for your transcoding script! its the onliest raspberry hardwareVideo transcoder (that streams to network) i got working! 1kane wrote: thanks for your fast reply. 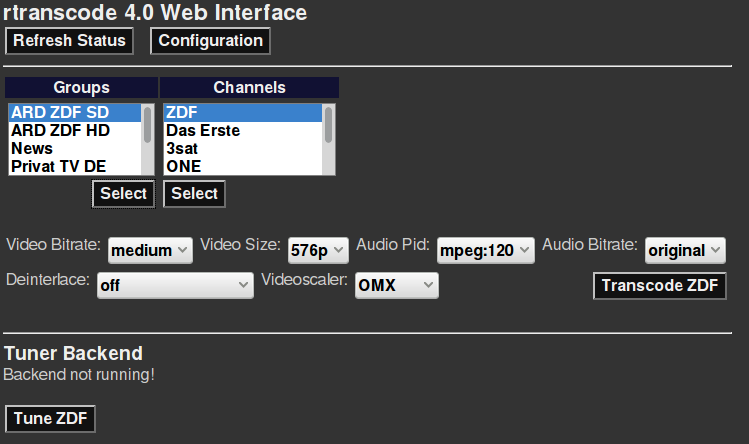 For SD channels I use 360x288, for 1080i channels 768*432 (or 910*512). 720p50 channels can be send with any resolution. This may seem stupid, but I've gotten all the way through configuring and I'm getting the "Listening on http://... message, but how do I actually watch the transcoded stream?? kylemassey86 wrote: This may seem stupid, but I've gotten all the way through configuring and I'm getting the "Listening on http://... message, but how do I actually watch the transcoded stream?? what does that mean if I try to run transcode.py? what I am doing wrong or what is missing? PS: I ordered the mpeg-codec activator and wait for the activation to install this in confog.txt. Is this the reason for "No such file or directory" ? 2) Check if all gstreamer-1.0 libtraries are isntalled. My preferred way is using synaptic and searching for gstreamer. do you have any idea how I can install it without synaptic? gstreamer1.0 has quite a lot of packages- Some of them are installed by default (to support epiphany browser), but not all. If you don't want to install synaptic, you can also use PiPackages. Search for gstreamer1.0-plugins. the transcoding works, but with freezes after few minutes. Unfortunately I can not setup higher bitrate, keeping the transcoding power. What cann I do, to make it usable? I need more details what you are trying to do.